I don’t know about you, but I find the saying, “Good Moms have sticky floors, dirty ovens, and happy kids,” disheartening. This is not to say I don’t understand where it is coming from I do, and to that extent I appreciate the sentiment. I appreciate the fact that who ever first said it only wanted to encourage mothers who are worried because their homes are not as clean as they might like. I feel like this saying wants to play mind games with me though. Sometimes when I see someone share it I think great, what does that make me though? 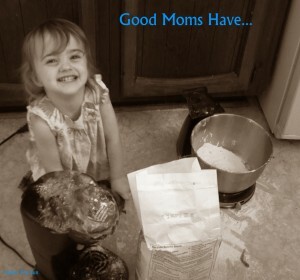 Certainly I’m not a bad mom, just because I can keep a relatively clean house with kids. What it means is I have different standards . I try to do my chores with my kids. I try to do many of my chores right along side them, working with them and teaching them as we go. I want my girls to have the skills to take care of themselves when they leave this house one day. I also see little girls who are eager to spend time with Mommy no matter what she is doing, so let’s work together for a little bit and get chores done and bond. Bonding doesn’t have to be regulated to dolls, tea parties, building blocks, and trains. Bonding can occur while baking, sweeping, folding laundry, or washing dishes. I would rather encourage a discouraged mother by telling her she is doing the best job she can for her kids and they are happy and loved. By saying good moms do ‘x, y, or z’ we are neglecting good mothers who are not doing those things, whatever those things are that are on our lists. Instead, let us love one another and celebrate the fact there is not one right way to be a good mother, there are many right ways. This entry was posted in Uncategorized on August 13, 2013 by Sara R.